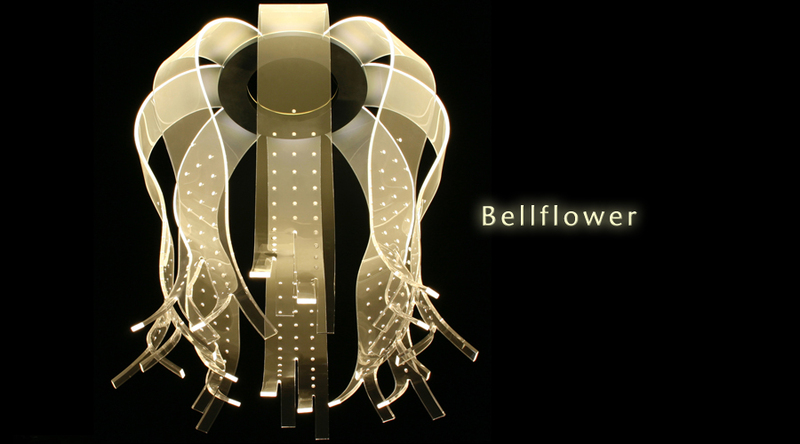 People have come to refer to this plant as Bellflower because its flower looks like a hanging bell in churches or temples. In Japan, it is called the Firefly Sack because it is said that Japanese people in olden times enjoyed the light of a firefly by placing it inside flowers. The acrylic boards represent the flower and the dots carved on them represent the fireflies. People experiencing this lighting will be impressed by the sense of sophistication: all of the petals of the flower emit light, the fireflies are illuminated, and the edge of a flower responds to the breeze. This lighting is the ideal means of adding emphasis to subdued surroundings.